The German CHP specialist ETW Energietechnik has delivered natural gas combined heat and power (CHP) units with selective catalytic reduction (SCR) technology for the first time. Stadtwerke Duisburg is the first user of Adblue technology from ETW. The family business from Moers comprises three plants with CHP engines of the type TCG 2020V12, each with an electrical output of 999 kW. Two of the three ETW plants with significantly reduced nitrogen emissions have been in operation since the end of 2017 – at the Duisburg-Mitte and Duisburg-Süd sites. 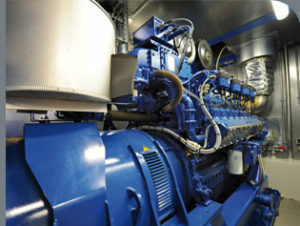 The third plant in Duisburg-Süd will also be commissioned at the beginning of 2019, with all three plants achieving an overall efficiency of 94% each, with an intelligent heat utilisation concept based on a second installed exhaust gas heat exchanger stage (AWT) and a heat recovery from the mixed cooling circuit.